REPHRASING EXERCISES TO PRACTISE THE USE OF FOR- SINCE- AGO- JUST- ALREADY- YET. ANSWER KEY INCLUDED!!! HAVE A NICE WEEKEND!! Unscramble the words for weather, complete sentences , answer questions and match with pictures. Fully editable!! Have a nice day!! 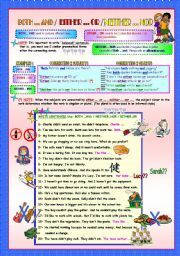 A GRAMMAR GUIDE WITH DIFFERENT EXAMPLES AND EXERCISES TO PRACTISE THE STRUCTURES WITH PICTURES. ANSWER KEY INCLUDED!!! EXERCISES TO PRACTISE THIS SPECIAL KIND OF COMPARATIVE (DOUBLE COMPARATIVE). aNSWER KEY INCLUDED!! HAVE A NICE WEEKEND!! Mother´s Day is celebrated in the USA and many other countries next Sunday (2nd Sunday in May). 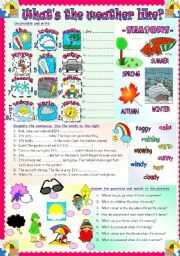 A reading comprehension worksheet that includes:re-order pictures,answer questions, True/False activity, a word search and a small poem. Answer key included! Fully editable! Have a nice week! Three activities to practise compound adjectives: adjective + noun(-ed). Answer key included. I hope you can use it with your students too. Have a nice day! (REUPLOADED: New layout and more pictures). 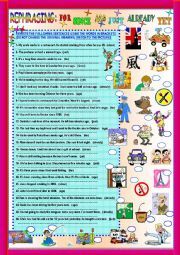 40 sentences to practise word formation. This time: NOUNS FROM ADJECTIVES, NOUNS FROM VERBS. Hope you find it useful. Answer key included. Have a nice week!! 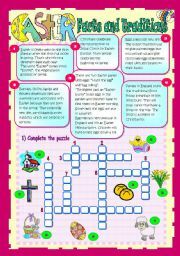 Two pages that include some facts and traditions about Easter, a crossword puzzle, a True/False activity, a comprehension exercise, a table to complete and two Easter poems for kids. Fully editable!! Have a nice week !! 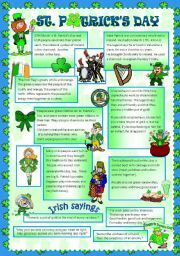 Some facts and traditions about St. Patrick´s Day and some Irish sayings. A multiple choice activity and pictures to label. Fully editable! Have a nice day! Some practice on the use of negative prefixes. Answer key included! Have a nice weekend! 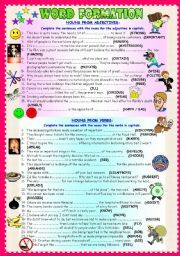 Practice on the use of Present Simple (affirmative and negative). Students have to correct the statements according to the pictures. 13 colourful slides. Fully editable! Have a nice day! 15 slides to practise –ED pronunciation in regular verbs. Students must look at the sentences, choose the correct final pronunciation of the verb and practise it in the context of the sentence. I hope you find it useful. Have a nice day! A powerpoint for young learners to practise HAVE/HAS GOT. You can use the 1st slide to practise the affirmative and negative forms and the rest of the slides to make questions (using prompts)and short answers. Fully editable. Hope you can use it with your students. Have a great day! 12 slides (for pre-intermediate students) to practise PRESENT PERFECT+ JUST / ALREADY / YET. They have to choose the correct option and then complete the sentence using the Present Perfect tense. Hope you can use it with your students. Have a nice day! 10 colourful slides to practise people´s clothes. 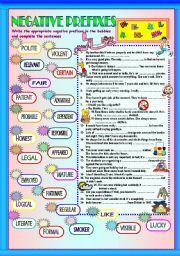 Hope you find it useful for your young learners. Fully editable! Have a nice Thursday! 12 COLOURFUL SLIDES. SOME ORAL PRACTICE OF PRESENT PERFECT CONTINUOUS FOR UPPER ELEMENTARY STUDENTS. 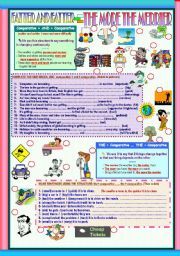 THIS PPT IS BASED ON MY WORKSHEET: http://www.eslprintables.com/printable.asp?id=571307#thetop. FULLY EDITABLE!! HAVE A NICE WEEK! A powerpoint to revise Household tasks and HAVE TO. Students choose the correct task and use it in a sentence (affirmative, negative or interrogative)according to the instructions. Hope you can use it with your students. Have a great week!